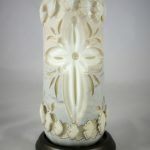 These candles can either be burned (follow our burning instructions if you want to preserve the beauty of our candles for years to come), or they can be pre-drilled at your request to accommodate an LED for convenience. 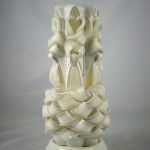 Our traditional basket-weave bottom is topped by doves, swans and crosses, with small hearts scattered about. Make Size and Pre-Drilled Well choices before viewing colors. 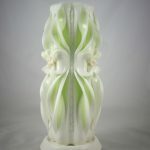 In addition to being used for weddings and anniversaries, the Sweetheart design candles are often used for births, baptisms, memorials or any other occasion that is close to one's heart. 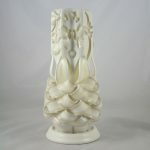 These candles have the full basketweave curls on the bottom that we are so well known for, and sculpted hearts encircle the top. Make Size and Pre-Drilled Well choices before viewing colors. Elegant and classic, this streamlined candle is adorned with clay roses. Make Size and Pre-Drilled Well choices before viewing colors. 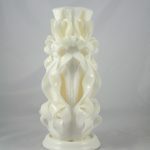 Sweeping vertical ribbons of wax are topped by sculpted hearts on the large size of this candle. Make Size and Pre-Drilled Well choices before viewing colors. These candles become treasured family keepsakes. Make Size and Pre-Drilled Well choices before viewing colors.